So your planning the perfect special event, your desire is that your guest have the most memorable experience ever. You can do just that with St. Charles Cigar Club - Mobile Cigar Lounge. Give your guests something new and unique…a place where they can select a premium cigar and then enjoy their smoke with other guests in a comfortable full-service mobile cigar lounge. 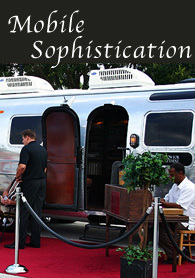 Our mobile cigar lounge will provide your guests with a unique experience to remember. Our mobile cigar lounge comes complete with a stocked humidor, HDTV Flat Screen, leather seating, air filtration system and subtle music, all built into a state-of-the-art classic pull along 1974 Airstream trailer. Show your clients you value their business or make your next event even more memorable. To find out how you can have our Mobile Cigar Lounge at your next event, click on the Contact Us tab at the top of this page. The St. Charles Cigar Club would like to thank those companies that have graciously supported us and helped us get to where we are today. If it were not for the support of these great businesses, we may not be here today. We therefore ask that if at all possible, you please show your appreciation by supporting the following companies and thank them for us. The St. Charles Cigar Club would like to help you make your next event even more memorable. For this reason we offer multiple packages to fit your budget and needs to give your guest an unique cigar experience they will always remember. Please feel free to contact us to specialize a package for your special event as well as all day or multi-day events. Planning a tailgating event, see our Sporting Events page for more information.